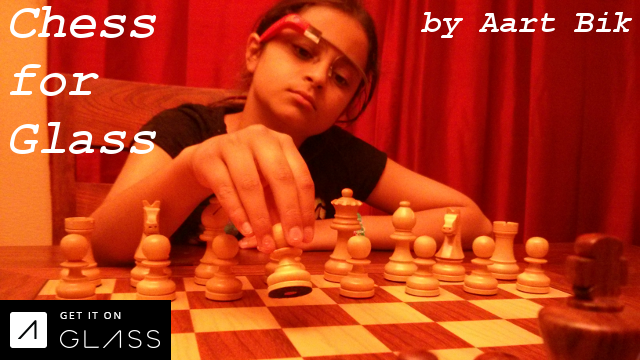 Chess for Glass is Glassware that runs directly on a Glass device. It was developed using the GDK (Glass Development Kit). One can enter moves by simply saying the moves, or by using the touch pad. 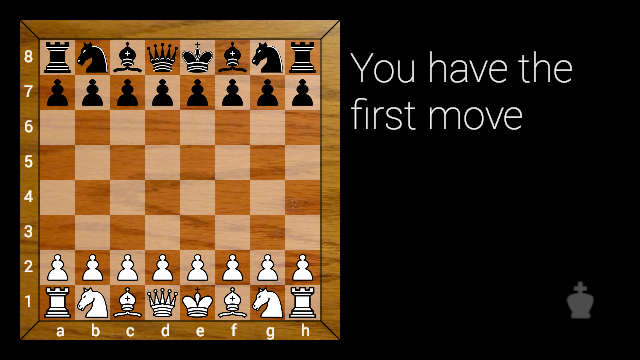 Other features include a choice in board color, spoken move announcements, and the ability to import any third party chess engine to replace the friendly built-in Java engine. 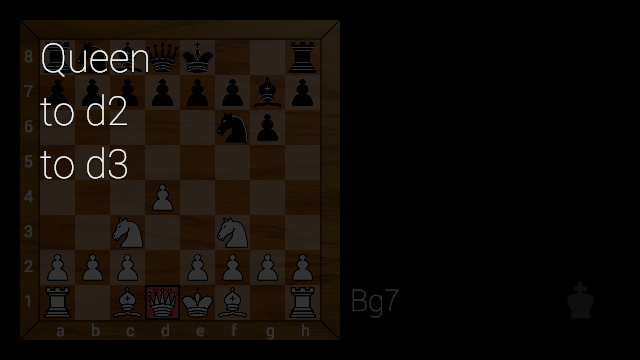 Chess for Glass recognizes Android Chessbase compatible engines and supports both the popular UCI and XBoard/WinBoard protocols. Tapping the touch pad opens the following menu strucure. New game: Starts a new game from the initial board position with white to move. Take back: Takes back the last played half-move, which is a move by either black or white. When done after the engine has done its move, this option changes the side-to-move. Taking back another half-move or switching side will let the computer play the original side again. Switch sides: Switches the side played by the computer. For example, if the computer was playing white and the user black, switching sides will let the computer play black and the user white. Rotate board: Rotates the board. Useful in combination with switching sides if the player prefers to play from the bottom. Levels: Sets the computer playing strength, defined as the amount of time taken per move. Voice input: Enables voice input. When "ok glass" is shown, the user can enter a move by saying this hot phrase, the piece to move, and the source (from) and destination (to) square designated by file and rank. The menu is automatically pruned to support fast input, i.e., the from- and/or to-square are omitted when there is only one choice. Example: "ok glass, queen, to d2" plays Qd2. Phonetic alphabet: Enables a phonetic alphabet for voice input. In this mode, the voice input uses a phonetic alphabet for files (alpha, bravo, charlie, etc.) without further from or to designation. 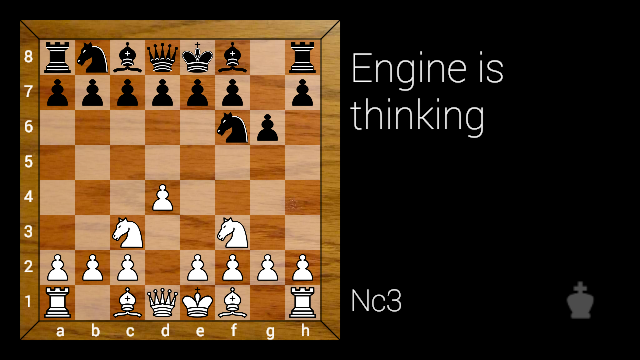 Example: "ok glass, pawn, echo two, echo four" plays the pawn from e2 to e4. Although uncommon in chess notation, this form of voice input is less prone to sound ambiguities. Spoken moves: Enables spoken move announcements. Board Colors: Selects various board colors. 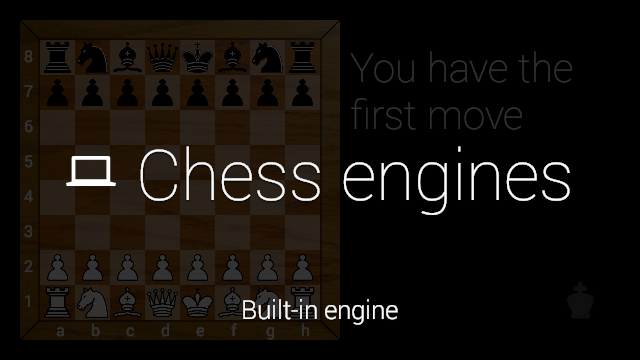 Chess engines: Opens a menu structure with all the Android Chessbase compatible engines that are installed on the same Glass device. This option allows chess hobbyists to replace the friendly built-in Java chess engine with a more powerful third party chess engine. The engines can even access endgame tablebases installed on the SD card. 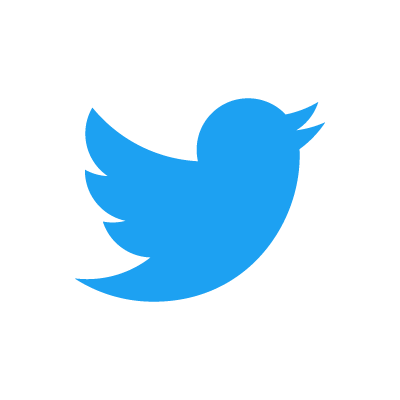 Glass is a trademark of Google Inc. Use of this game is subject to the Terms of Service.